A world famous pier? You betcha. Organic coffee shops, urban art and a hip shopping district? Wait, are we still talking about Santa Monica? With the redesign of SantaMonica.com, we have shifted the narrative away from Santa Monica being a mere beach town to it being a viable hub for a full-blown SoCal vacation, whether overnight or for a weeklong stay. 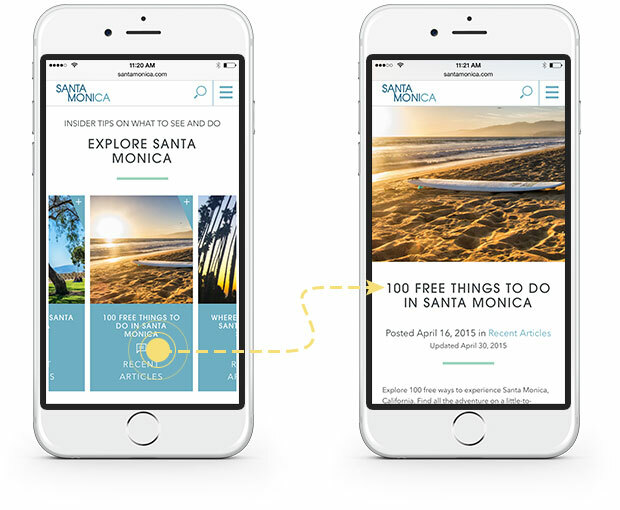 Research made it clear the new site needed to speak to both international and domestic visitors and better explain the Santa Monica story. International travelers would be shown that Santa Monica was the perfect hub for a trip to the Los Angeles area. After all, they stay in the states on an average of two weeks apiece. U.S. visitors would see that Santa Monica is much closer to attractions like Disneyland and Universal Studios than they previously imagined. With the new site, Santa Monica is positioned as the perfect place to kick back and recharge your batteries in between trips to Rodeo Drive, Hollywood and Knott’s Berry Farm. Original content and enhanced maps play a leading role on the new site. Because Santa Monica is made up of eight distinctive neighborhoods; each with its own personality and attractions, we built a map highlighting the various neighborhoods. Rolling over a portion of the map shows visitors quick descriptions of the area and its attractions. In the mood for casual, laid-back dining? Santa Monica has a neighborhood for that. Bright and airy, the new site focuses visitors’ attention on the casual luxury and abundance of activities in Santa Monica. Each neighborhood’s distinct personality and its variety of options shine through with new mapping tools. Planning your day? Select a point of interest on the map to display nearby businesses like restaurants, hotels. The site also serves to show just how close Santa Monica is to all the action. Click a button marked “Beverly Hills” to discover that the chic shopping district is a mere 7.4 miles from Santa Monica. Also, through IP location detection, the site automatically shows distances to hotels and other amenities from the user’s location. Users ready to commit to a trip can browse hotels by date and cost, then book via the Jackrabbit booking engine. 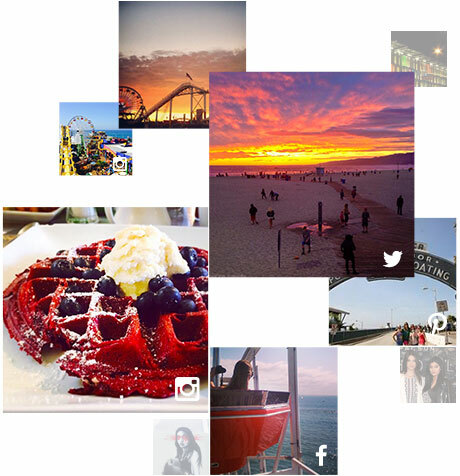 The Santa Monica Travel and Tourism’s blog posts, chock full of helpful tips, itineraries, and links to stakeholder businesses, are sprinkled throughout the site to further encourage visitors to explore Santa Monica far beyond the pier and beach. We also identified opportunities to boost search rankings using specific keywords (i.e., “driving from LAX to Santa Monica”) while providing useful tools for out-of-town visitors. By optimizing landing pages using thoughtful, clear content–with an SEO focus–we were able to boost traffic to the site immediately as well as enjoy long-term results. Leveraging user generated content from social, Noble added a curated feed that pulls imagery and posts from Twitter, Pinterest and Facebook. To satisfy visitors looking for independent reviews, the site also pulls Yelp reviews to guide them in the right direction with restaurants and other businesses. 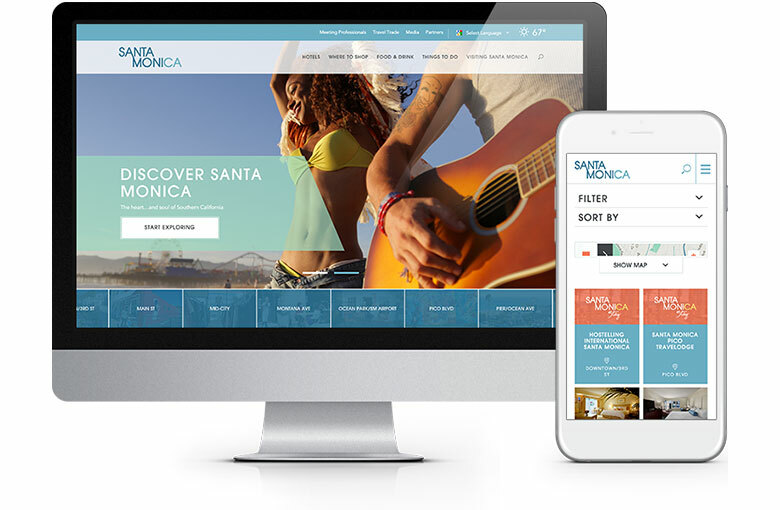 Since its launch, SantaMonica.com has seen a significant boost in mobile traffic as well as overall site traffic, new visitors and average session duration. The site is also gaining positive traction in referrals to stakeholder websites.